That’s the caption under a photo of a robotic hand holding a pen that the digital news outlet Quartz (qz.com) used to introduce a recent article about an insurer using cognitive technology powered by IBM Watson to replace a portion of its workforce. 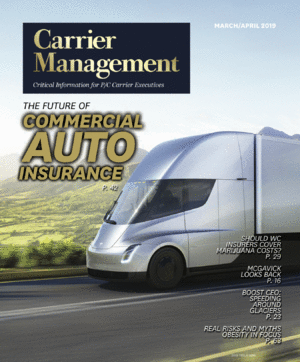 As Carrier Management reported in the first article of this two-part series, the insurer was Japanese life insurer Fukoku Mutual Insurance, and the jobs at risk are actually those of medical claims processors rather than insurance underwriters. In the second of two articles about artificial intelligence and insurance, Carrier Management aggregates research from various sources about the impact of automation on underwriters and agents, as well as on professions outside the industry—businesses they insure. In part 1, we reported on carrier efforts to use cognitive technology to replace or work alongside their existing claims processing staff. 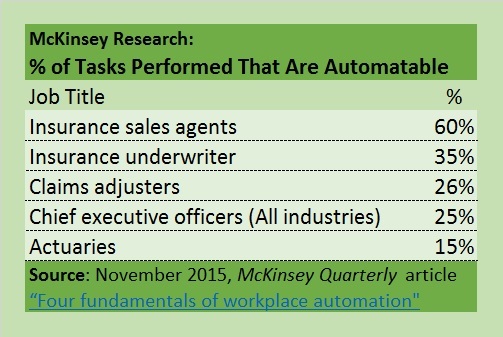 Still, underwriters aren’t immune from the prospect that automation will have put at least some aspects of their jobs in jeopardy. Just a few weeks before Fukoku’s announcement, in fact, the job of insurance underwriter was ranked No. 6 on a list of the 10 most endangered jobs for 2016—just below jewelers and above seamstresses, according to the ranking from CareerCast.com. No other insurance jobs—not even claims processers—were ranked among the 10. And unlike more endangered jobs—including No. 1, mail carrier; No. 3, meter reader; and No. 4, disc jockey—that are being directly taken over by machines, there are other humans around to take the jobs of underwriters, CareerCast researchers believe. “Software programs that streamline the underwriting process have made it possible for the work of insurance underwriters to fall under the duties of other titles in the industry,” CareerCast said in its one-sentence explanation of the ranking. Who are the holders of these other titles? CareerCast was more explicit in its explanation of a No. 9 ranking for insurance underwriters back in 2015. “Streamlined processes allow agents to take on the work previously handled by underwriters,” said the explanation on the Internet site that repeatedly ranks insurance actuaries among the top careers. A related idea seems to be suggested by the activities of another Japanese life insurer in an article about Fukoku in the Japanese National Daily Mainichi, which notes that Nippon Life Insurance Co. started using an AI system in December “to analyze the best coverage plans for individual customers, based on some 40 million insurance contracts held by its various salespeople.” The system’s results “are then used as a reference by the sales offices,” the article says. But it’s not entirely clear whether such actions put the jobs of any underwriters or sales professionals at risk, or whether they just enhance the customer experience. At Zurich Insurance Group, automation initiatives are in progress in efforts to improve technical proficiency in both claims and underwriting functions. During a November Investor Day event, Zurich’s Group Chief Operating Officer Kristof Terryn detailed “efforts launched to reclaim underwriting excellence” at the company, such as the use of cognitive computing “to continuously detect anomalies and nuances” in datasets while improving the precision of models and underwriting rules. One such tool will “automatically grade risk factors in risk engineering reports,” he said. “The software typically takes the customer’s words, converts them to text and analyzes whether those words are positive or negative,” the article says. More broadly, the qz.com article declares that “artificial intelligence systems like IBM’s are poised to upend knowledge-based professions like insurance and financial services,” citing an analysis published in Harvard Business Review in June, titled “The Knowledge Jobs Most Likely to Be Automated.” In the HBR article, authors Julia Kirby and Thomas H. Davenport (who also co-authored the book “Only Humans Need Apply: Winners and Losers in the Age of Smart Machines”) are actually far less emphatic, however. “We have to admit there are some knowledge-work jobs that will simply succumb to the rise of the robots. They are just too thoroughly composed of work that can be codified into standard steps and of decisions based on cleanly formatted data,” they write. Going on to raise their own red flag, calling out the “many routine and information-intensive tasks” that computers will take from human workers,” Kirby and Davenport do come to an unhappy conclusion. “There will undoubtedly be layoffs. Compliance workers will either be looking for work or lonelier at work, and that stinks,” they write. More specific to the P/C insurance industry, Dr. Anand S. Rao, principal for Insurance Advisory Services and Innovation Lead in PwC Analytics, and Joseph Calandro, managing director in PwC’s Insurance practice, see clear benefits for insurance carriers and customers. In an August 2016 article they authored for Carrier Management, “Artificial Intelligence in Commercial Insurance,” they explain RiskBots and UWBots—artificial intelligence applications that can augment the decision-making of commercial underwriters for emerging risks and complex risks, like supply chain risks. For example, natural language engines can continuously evaluate a large number of news and social media sources to report on key concepts underlying new risks. As insurers “train” the engines to look for specific sources and types of articles—and the systems learn over time—they can graph trending topics, sectors and companies associated with certain risks, and the underlying impacts if the risks develop adversely, the PwC experts note. More recently, the Obama White House released a report (“Artificial Intelligence, Automation, and the Economy“) detailing the benefits and challenges of AI-driven automation—on the one hand, creating wealth and expanding the American economy in the years ahead as living standards and leisure hours increase for some; on the other hand, also exacting a cost as the skills that workers need to succeed in the economy change and structural change in the economy takes hold. See related textbox, “What the White House AI Report Says,” below for a discussion of policy responses. “Advancements in computer vision and related technologies have made the feasibility of fully automated vehicles (AVs), which do not require a human driver, appear more likely, potentially displacing some workers in driving-dominant professions. The capabilities of AVs, such as “navigating complex environments [and] analyzing dynamic surroundings,” are similar to those of a household-cleaning robot, [and] yet the technology that would enable a robot to navigate and clean a space as effectively as a human counterpart appears farther off. But the impact will not be even for all commercial drivers, according to a chart of driving occupations—including bus drivers, light truck and delivery, heavy and tractor-trailer truck drivers, school bus drivers and taxis—on which the White House Council of Economic Advisers (CEA) provides estimates of the percent of jobs in each driving occupation threatened. More non-driving tasks, like attending to children for school bus drivers, mean a lower range of displacement (30-40 percent for school bus drivers vs. 80-100 percent for tractor-trailer truck drivers). AI will also create jobs in four categories, according to CEA: in areas where humans engage with existing AI technologies, develop new AI technologies, supervise AI technologies in practice, and facilitate societal shifts that accompany new AI technologies. As an example of a field where humans need to actively engage with AI technologies, the report highlights health care. “IBM’s Watson may improve early detection of some cancers or other illnesses, but a human health care professional is needed to work with patients to understand and translate patients’ symptoms, inform patients of treatment options, and guide patients through treatment plans,” the report says. Using the triage system in the app instead of calling a human to describe their ailments over the phone—a process that reportedly takes 10-12 minutes, on average—some Londoners will be able to type in their symptoms and then respond to roughly a dozen follow-up questions in a process that will take about a minute and a half, the article states. Back squarely within the P/C insurance industry itself, and back in the world of claims processing, upstart Lemonade reported its latest application of AI last Thursday. “A.I. Jim, Lemonade’s claims bot, reviewed a claim, cross referenced it with the policy, ran 18 antifraud algorithms on it, approved the claim, sent wiring instructions to the bank,” and informed the policyholder the claim was closed—all in three seconds, the company said in a media announcement. Lemonade speculated that speedy processing of the claim “for a $979 Canada Goose Langford Parka” may have been the fastest ever, and noted that it beat the industry standard of a payout within 30-45 days by a wide margin. In a December 2016 report titled “Artificial Intelligence, Automation, and the Economy,” the Administration examined the expected impact of AI-driven automation on the economy and described broad strategies that could increase the benefits of AI and mitigate its costs. Positive contributions to aggregate productivity growth. Changes in the skills demanded by the job market, including greater demand for higher-level technical skills. Uneven distribution of impact, across sectors, wage levels, education levels, job types and locations. Churning of the job market as some jobs disappear while others are created. “Because the effects of AI-driven automation will be felt across the whole economy, and the areas of greatest impact may be difficult to predict, policy responses must be targeted to the whole economy,” the White House said in an announcement about the report. Invest in and develop AI for its many benefits. Educate and train Americans for jobs of the future. Aid workers in the transition and empower them to ensure broadly shared growth. Will Artificial Intelligence Replace Industry Jobs? Could Smart Computers Really Replace Half of U.S. Jobs? Human Robots: Will They Kill the Financial Services Industry?